18 | February | 2015 | The Intraracial Colorism Project, Inc. The Hidden Prejudice in Education. Understanding How Colorism, Prejudice, Racism and Stereotypes Can Affect the Dreams of Students of Color! 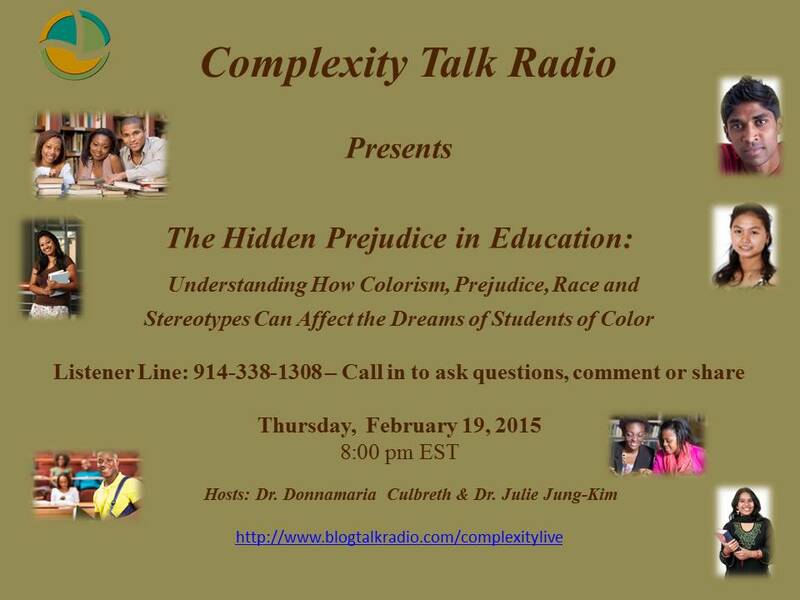 The Dynamics of Colorism Talk Radio has a new name: Complexity Talk Radio (Complexity Live) featuring hosts Dr. Donnamaria Culbreth and Dr. Julie Jung-Kim. We will continue to feature a monthly segment titled The Dynamics of Colorism. Join Dr. Culbreth & Dr. Jung-Kim for a discussion on The Hidden Prejudice in Education: Understanding How Colorism, Prejudice, Racism and Stereotypes Can Affect the Dreams of Students of Color!